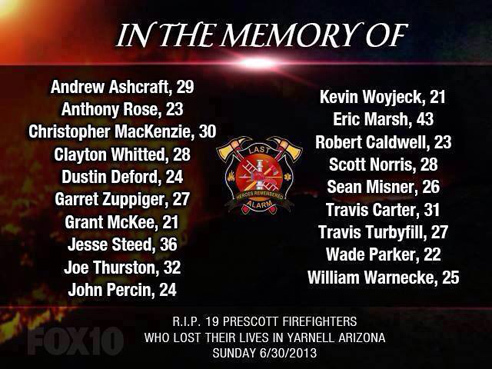 Today, July 9, 2013, there will be a celebration of life memorial in Prescott Valley from 11:00 AM – 1:00 PM Pacific to honor Arizona’s 19 elite firefighters killed in the Yarnell Hill Fire. AZCentral.com reports all available tickets for the service at the 5,000-seat Tim’s Toyota Center are gone with bulk of the tickets being issued to family of the Granite Mountain Hotshots crew and support “fire family” personnel. Live streaming coverage of the 2 hour service can be viewed on the U.S. First Responders Association forum thanks to a feed from AZCentral / NBC. 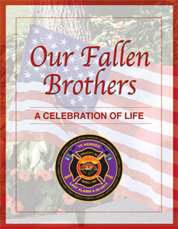 The program for the Memorial is available here (8-pg PDF). Our thoughts and prayers continue to go out to the fallen heroes families, our state of Arizona and the entire firefighter/EMS nation. Arizona suffered a devastating loss yesterday. 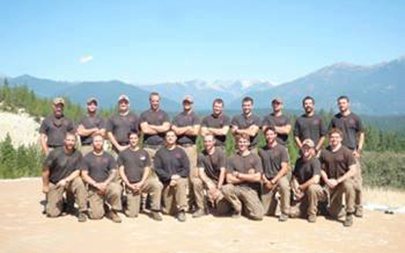 Nineteen firefighters from the elite Granite Mountain Hotshots of Prescott, died Sunday fighting an out-of-control wildfire in Yarnell, a tiny Yavapai County town roughly 80 miles northwest of Phoenix. About half of the town’s 500 homes were feared destroyed by the blaze, which began early Friday evening and had spread to 8,374 acres by early Monday. 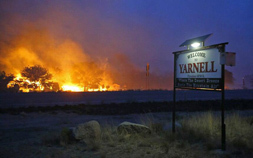 All of Yarnell and the neighboring Peeples Valley were evacuated. 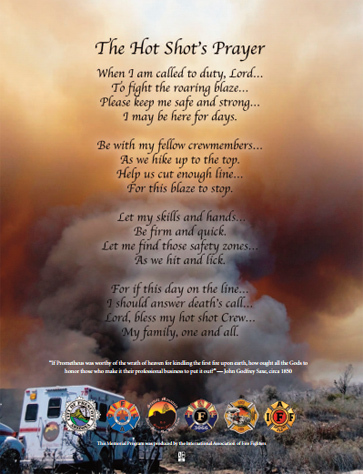 Fire crews reported no containment as of Monday morning (1-Jul-2013). The National Fire Protection Association website lists the last wildland fire to kill more firefighters as the 1933 Griffith Park fire of Los Angeles, which killed 29. The most firefighters — 340 — were killed in the 9/11 terrorist attacks in New York. Just one week ago, the same crew also led the charge against the massive Doce fire in the Prescott National Forest.